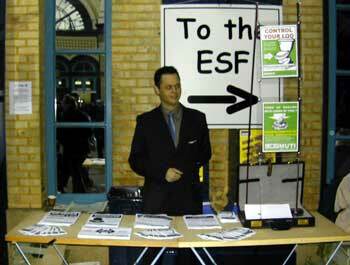 Corporate Truth Merchants, The MUTI Corporation headed down to Alexandra Palace to spread the word of efficiency and good toilet practice to the collection of lefites in attendance to the ESF (European Social Forum). 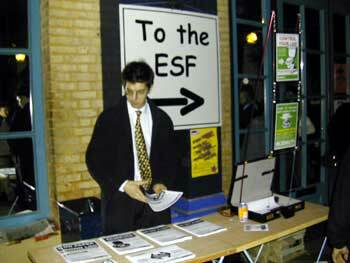 With a display stand and leaflets ready for the ESF (Effective Sanitation Focus), the hard working and efficient men at MUTI set up stall right outside the main entrance. 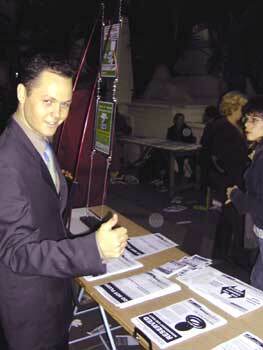 Their leaflets and stall explained the benefits of organising an efficient toilet regime at work. Maximising profit and efficiency, whilst reducing waste time and waste products of the work force. Why waste company money on things like toilet paper, when employee's can bring their own? Why allow employees to flush, when they can take their paper to their desk? As you can imagine the activists were impressed with the profit driven level headedness of the MUTI schemes.